Here we go again! I look forward to Bonnie’s mystery quilt every year. 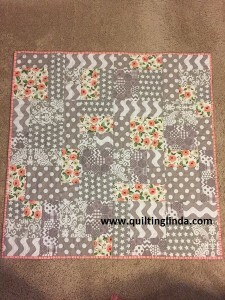 This will be the sixth year that I have joined the fun and the eighth Bonnie Hunter quilt I have made. In addition to the mysteries, I made Tropical Twist after taking a class with Bonnie and I made Pumpkin Patch from her pattern in a magazine. Both of those quilts were made in 2017. We will see how this works! The first clue went live on the Friday following Thanksgiving. Since I swapped colors, I am using green and neutral for clue 1. I cut them out and started sewing on Friday. On Saturday I finished the first clue. The seams on the back are swirled to prevent bulk in the center of the four patch. The finished four patches are counted and clipped together. I’m ready for the next clue! Click here to see other Good Fortune quilts. This summer is going by so quickly! It is hard to believe that July is almost gone! Since the arrival of my new quilting machine and frame, I haven’t done much piecing. I literally have a closet full of tops to quilt. My plan was to quilt all my Bonnie Hunter mystery quilts first. I could have quilted them on my old machine/frame but they are almost as long as that frame. It would have involved lots of bobbins of thread and a lot of rolling on the frame. I am happy to announce that all of my Bonnie quilts are finished! I quilted Celtic Solstice, En Provence, Grand Illusion, and the last mystery quilt, On Ringo Lake. I also quilted a top from the workshop taught by Bonnie last summer, Tropical Twist. I enjoy quilting with the new machine! It has been problem free (knock on wood). One of the nice things is that I don’t have to change bobbins as often. I haven’t done dense quilting and only have had to stop to change the bobbin once on each quilt. Besides the five quilts I mentioned previously, I have quilted five other quilts. 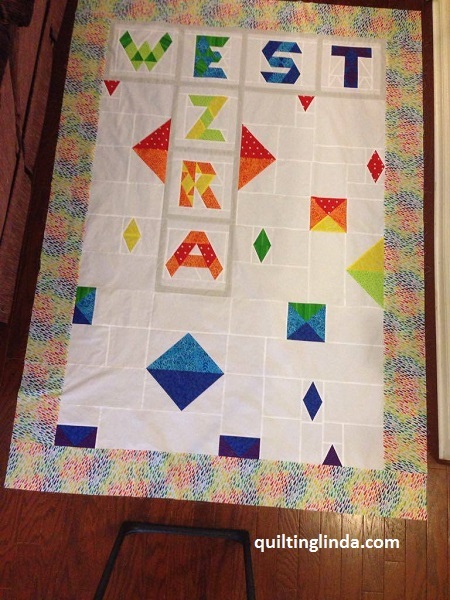 The first was a baby panel that I loaded for a practice quilt. I used flannel on the back and it turned out very well. I donated it to Moms2B through my quilt guild. (I forgot to take a picture.) I finished a small house wall hanging , a paper doll quilt with clothes for the dolls, and a wall hanging made from a Moda Frivol. I did piece and quilt another baby quilt this month for my new granddaughter who is expected in November. 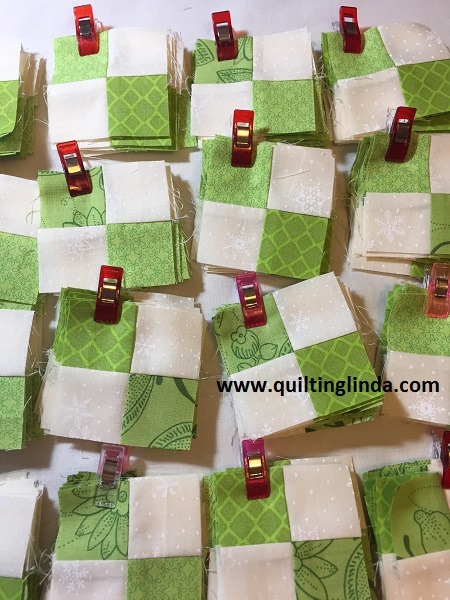 I used the Yellow Brick Road pattern with fat quarters I received last Christmas. I had four blocks left over which I made into a doll quilt for her. I am sorry for the poor photography. We had a rainy week when it was taken. This is Tropical Twist. It is made entirely from my scraps. The reason I am enjoying Bonnie Hunter’s patterns is because she is a scrap quilter. I have learned how to choose fabrics from my scraps by following her patterns. Thank you Bonnie! Bonnie surprised us by releasing clues 6 and 7 in rapid fire mode. We received the 6th clue on Friday as we usually do. On Saturday she posted clue 7. They are easier clues, working with pieces we made previously. In Clue 6 we added triangles to the pieced triangles from clue 4. Clue 7 had us joining the flying geese from clues 2 and 5. It’s not too late to join the mystery quilt. Bonnie will have the free clues on her blog until February 1, 2018. After that date they will be removed and will be available for sale at a later time. I have finished Clue 5 just in time for the next clue to arrive tomorrow! I don’t mind making flying geese but have had my fill of them for now. Clue 2 was also flying geese. It is the cutting that I don’t really enjoy. I have been using Bonnie’s Essential Triangle Tool to cut the flying geese. I like that they are cut from strips and fit together so well. My old method was No Waste Fast Flying Geese where you cut a large square and 4 small squares. It also involves drawing lines, sewing, and cutting and then repeating to make four FG at once. All the fabric for Clue 5 came from my scrap bin. I had to buy coral and aqua fabrics for this mystery but the rest of the fabric is from my scrap collection. Today I am linking up with Bonnie’s Link Up Party on her blog. These are just a few of my finished clue 4 pieces. I am almost done cutting out the triangles. I am still working on clue 3. I have been alternating between the two clues and loading a quilt on the frame. I finished loading Ezra’s quilt and started quilting today. After just a few inches, I stopped to examine the stitches. I then spent the next hour taking them out. The stitching looked fine on my trial piece but not on the quilt. I rethreaded the machine and cleaned out the bobbin area. It looked clean but I found a large piece of lint in the bobbin race after I had replaced the bobbin. By the time I was done “unsewing”, I was ready to take a break and fix dinner. 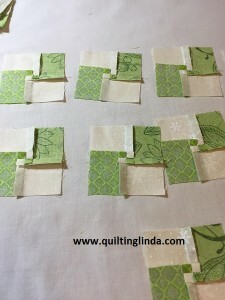 Wish me luck when I try to quilt again tomorrow! I am linking up to Bonnie’s link-up party at Quiltville. 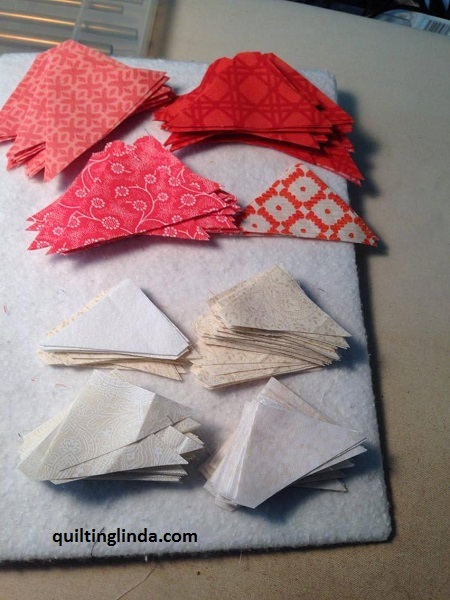 Take a peak at the fabrics other quilters are using. I am getting a late start on the third clue of Bonnie Hunter’s mystery quilt. I have been working on quilts for my two oldest grandsons, making quilts for the bunk beds in their new home. I knew I wanted to use the alphabet pattern from the book, Alphabet Soup, by Jaybird Quilts. Jaybird has created special rulers to use in their patterns. I have had the rulers for a few years and really wanted to use them. I told Jennifer my idea and she ran with it, designing a quilt pattern for me. I then had a picture to work with and created all the blocks to fit together. The letters were all the same height but I had to add fabric to the sides to make them all a uniform size. 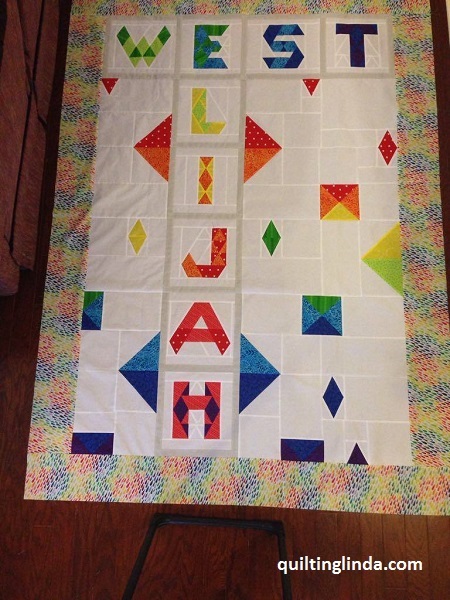 The rest of the blocks are half square triangles, quarter square triangles, flying geese, and triangle in a square made to fit in 12 inch blocks. Jennifer also helped me pick out the fabrics. She has a better eye than I do for choosing the right shade of each color. We found the multi-colored fabric (the borders) and chose fabrics to go with it. After having to do the frog stitch a few times, I finally finished both of the quilt tops today. 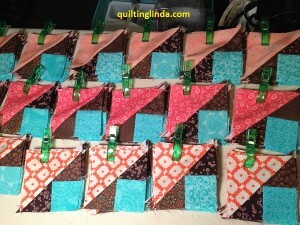 My plan is to get them loaded on the quilt frame and quilt them next weekend. Click on the pictures to get a closer view. 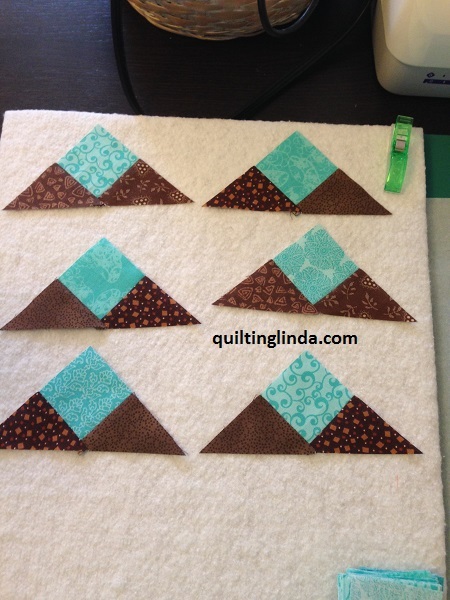 After finishing the borders on the boys quilts, I started working on the third clue of Bonnie’s mystery quilt. I cut all the strips I need. I am using a shortcut way to piece them. At this time I only have a few of them finished but my goal is to be finished and ready for the next clue by Friday. Click here to see the blocks made by other mystery quilters. This weekend has been busy for us. Sami’s 4th birthday party was held on Saturday. She had a wonderful time playing with her friends. We stayed after the party to watch the OSU game with Jen. I started working on my second mystery quilt clue on Saturday morning before we went to the party. We are making flying geese and I wanted to try two different methods to see which was easier and more accurate. 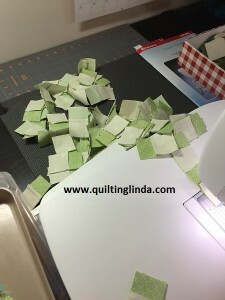 I usually use the Fast Flying Geese method but that includes a lot of drawn lines, sewing, pressing, cutting and more of the same to complete 4 flying geese. I did two sets this way and found that I had to trim all of them to get the correct size. Next, I tried Bonnie Hunter’s new method using her Essential Triangle Tool. I cut out a couple and sewed them. They are very accurate and I did not need to trim them to size. This is the method I decided to use for the rest of Clue 2. Today I worked on this clue until my daughter came over. 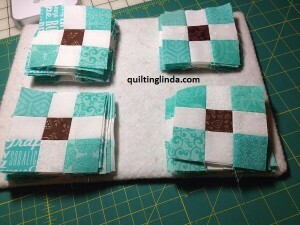 We are each making a mug rug to take to quilt guild this week for a swap. We are almost finished with them and I will share pictures after they are completed. 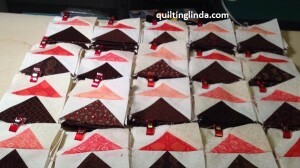 To see the flying geese made by other Bonnie Hunter mystery quilters, click here. One of my favorite quilt teachers is Bonnie Hunter. She is the queen of scrap quilts and is a great teacher. Since I have been following her, I am actually using my scrap fabric. I have it organized by color but I haven’t cut it into the sizes that she recommends. 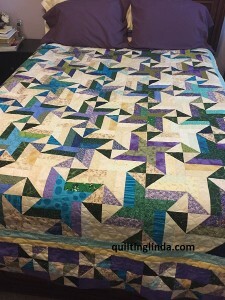 Every year she presents a mystery quilt on her blog, Quiltville’s Quips and Snips. It begins on Black Friday and usually ends around New Years Day. This year she says it may go a little longer into the month of January because of her busy schedule. Her new quilt is called “On Ringo Lake” and the colors are based on the sunrise she saw while on vacation at Ringo Lake in Minnesota. 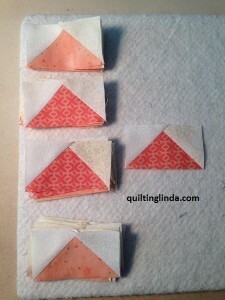 She again gave paint chip numbers to help us find the same colors that she used in her quilt. The first clue was given the day after Thanksgiving and her followers, including me, have been busy cutting and sewing blocks for the first clue. A new clue will be given each Friday until the big reveal in January. We had family here for the Thanksgiving holiday which we enjoyed immensely. They left on Friday afternoon. After getting a good nights rest, I started cutting strips for my first clue on Saturday morning. I had time to start sewing the blocks before we went to our daughter’s home to watch the OSU/Michigan game. 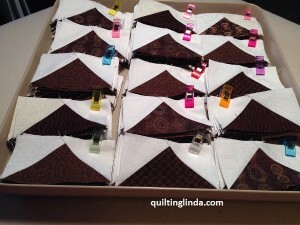 As soon as we arrived back home, I went up to my sewing room to finish my blocks. Here they are!!!! 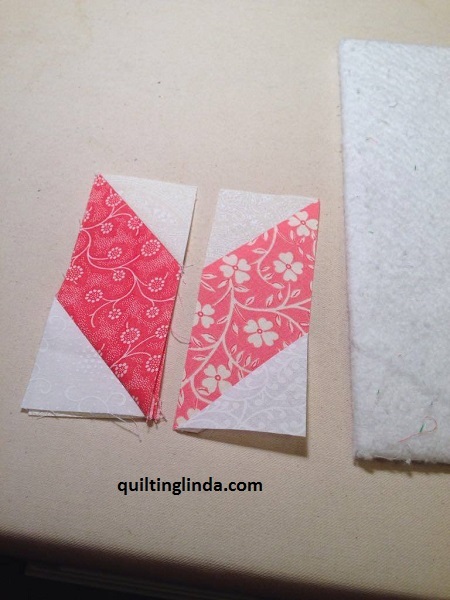 To see what other mystery quilters are doing, click here.